Check out the adorable Boy Diaper Cake Ideas below! My favorite thing about this cake are the flowers! Keesha, one of our amazing readers, added her ideas to our diaper cake gallery, continuing to 'pay it forward' with fresh and creative ideas, and helping to make this a useful and straightforward source of diaper cake ideas. 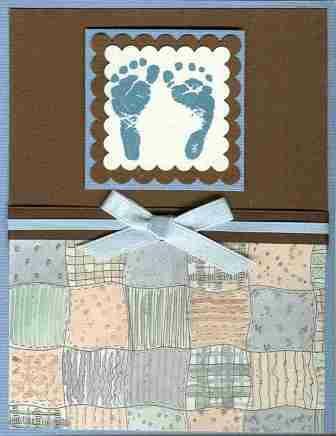 Keesha not only submitted a picture of her diaper cake, which turned out adorable, but she included pictures of her baby footprint invitations, her candy bar wrapper favors, and her thank you cards. 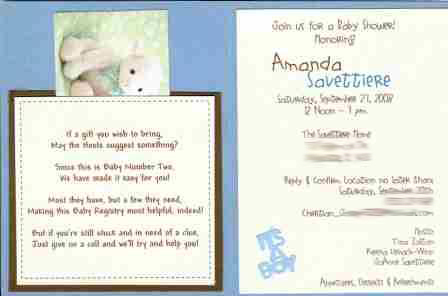 She has given us a glimpse of how the other aspects of a baby shower tie in and coordinates with her diaper cake. Very Helpful! Thank you Keesha, what a beautiful cake! If you have some pictures or ideas of a diaper cake and/or baby shower that you would like to share, submit 'em right here! I stumbled upon the discovery of Diaper Cakes while searching the Internet for ideas on favors to make for my Step-Daughter's Baby Shower. I thought the overall idea of incorporating much needed baby items into a cute favor and adorable gift for the Mom to Be was clever, so I decided it was worth taking the creative leap! Since I could not find any suitable ribbon, I made do with color coordinating 12x12 Cardstock Papers and flowers that matched the Baby Shower Invitations and Thank You Cards I made. It turns out I wasn't the only one there that had not previously seen a Diaper Cake before. While my Step-Daughter commented on how she would need more diapers, I told her she had 62 diapers in the Diaper Cake. She said she thought it was another cake when it was put on the table with the appetizers! Such a pretty diaper cake, Keesha! 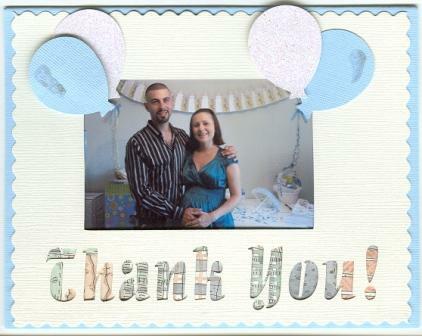 And thanks for sharing your invitation, thank you cards and favors TOO!! 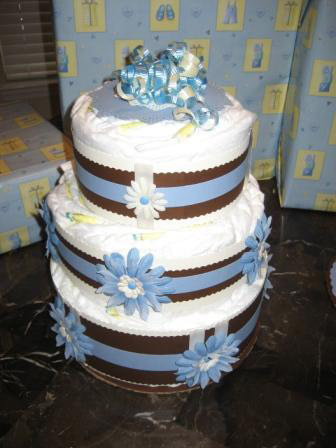 Do something different at the baby shower by making your own diaper cake! Here are step-by-step, picture instructions of how to make a diaper cake!